The IBM TS1150 tape drive gives organizations an easy way to deliver fast access to data, improve security and provide long-term retention—and for less expense than disk solutions. TS1150 offers high-performance, flexible data storage with support for data encryption. This fifth-generation drive can help protect investments in tape automation by offering compatibility with existing automation. Plus, an upgrade model is available for existing IBM TS1140 tape drives. What’s more, TS1150 supports the LTFS format in IBM Spectrum Archive for direct, intuitive and graphical access to data. Help maintain business performance and improve the performance of your tape operations with data transfer rate up to 700 MBps with compression. Support for a single encryption key management approach may help you reduce audit and compliance costs and avoid the need for host-based encryption of data or use of specialized encryption appliances. Utilize improved space efficiency of your tape infrastructure with the small form factor of TS1150 tape drive. Utilize next-generation technology to protect your existing tape investments while improving performance. 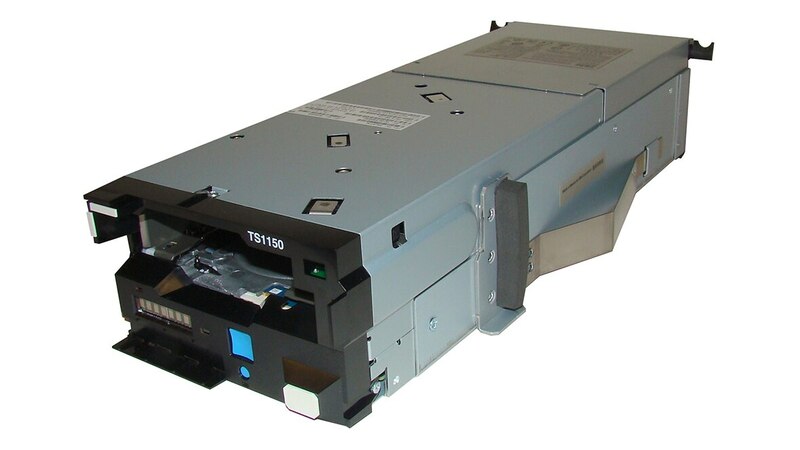 The TS1150 tape drive provides compatibility with existing IBM tape automation installations.